Born March 15, 1963 in Toa Baja, Puerto Rico. Rosario began boxing at age six. He competed in 30 amateur bouts, winning 28 and losing 2, and captured Puerto Rican Golden Gloves and Junior Olympic titles. In 1979, the 16-year old turned professional as a bantamweight and by age 20 was lightweight world champion. “Chapo” racked up 15 consecutive knockouts and under the guidance of Hall of Famer managers Bill Cayton and Jim Jacobs, set his sights on the lightweight title. 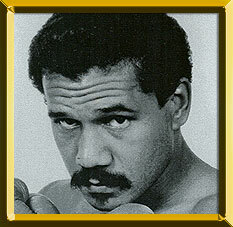 A win over tough veteran Edwin Viruet set up a 1983 battle with Jose Luis Ramirez for the vacant WBC crown. Rosario, who had been out of action for over a year due to a wrist injury, scored a 12-round win to capture the title. Two successful defenses (TKO1 Roberto Elizondo and W12 Howard Davis, Jr.) followed before being losing the title via 4th round TKO in a rematch with Ramirez. Undeterred, the slick boxing Puerto Rican rebounded to defeat Frankie Randall, then lose a controversial split decision to Hector “Macho” Camacho in 1986. That same year he scored a resounding 2nd round kayo over Livingstone Bramble to recapture the lightweight title (WBA version). A defense over Juan Nazario came next before losing the belt to Julio Cesar Chavez in 1987. In 1989 Rosario became only the second man to win the lightweight title three times (the first was Hall of Famer Jimmy Carter) when he stopped Anthony Jones in six heats for the vacant WBA belt. In 1991 he scored an impressive third round TKO over Loreto Garza to add the WBA light welterweight championship to his portfolio of titles. Following a loss to Randall in 1993, Rosario would not box again until 1997. After five comeback victories, Rosario, who had battled alcohol and drug addiction, died from acute pulmonary edema at the age of 34. Known for his exceptional boxing skill, dynamite right hand and rock-solid chin, Rosario's professional record stands at 47-6 (41 KOs).